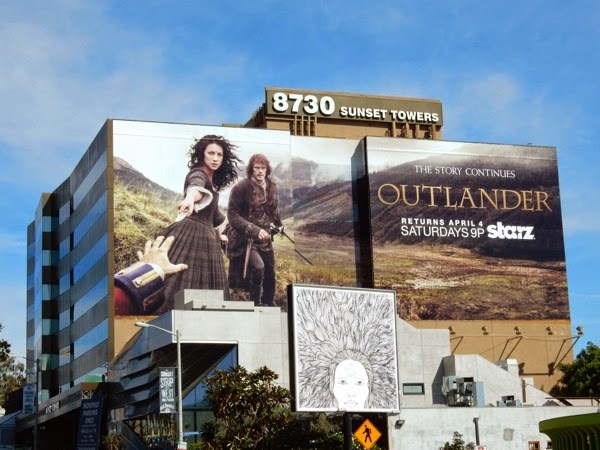 Starz must have known it was on to a winner when they adapted Outlander for the small screen, as they made the canny decision to split the first season in two. 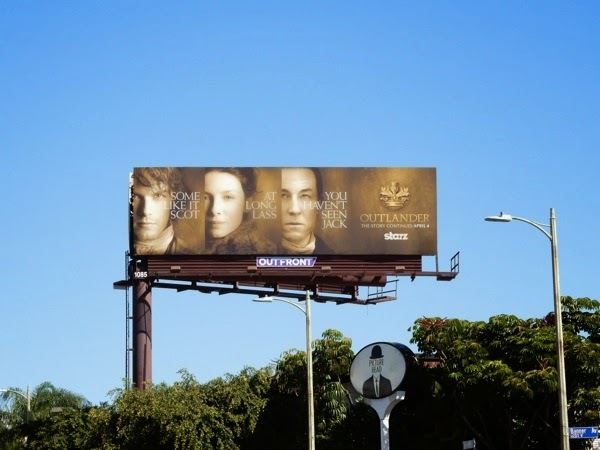 The time-traveling Scottish Highlands romantic drama series based on Diana Gabaldon's best-selling novels returns this April for the second half of its debut season, and the hit show had this outdoor ad campaign to support its midseason return and remaining eight episodes. 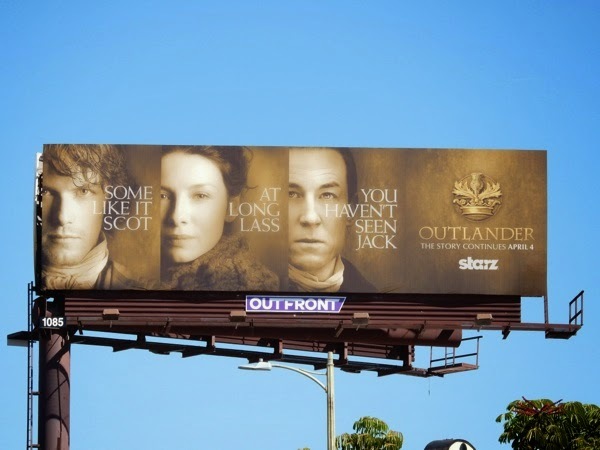 Firstly Starz teased us with these witty play on words billboards featuring the show's heroine 'Claire' (Caitriona Balfe) and her new Scottish husband, 'Jamie Fraser' (Sam Heughan) and their nemesis, the sadistic Redcoat 'Black Jack Randall' (Tobias Menzies). 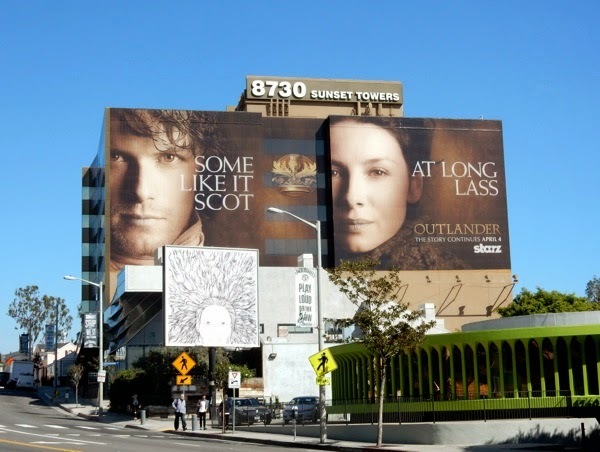 The giant-sized billboard spied along the Sunset Strip and the standard landscape version spotted along Vine Street in Hollywood on March 4, 2014, had taglines mashing up familiar phrases with fun Scottish twists, 'Some like it Scot', 'At Long Lass' and 'You haven't seen Jack'. 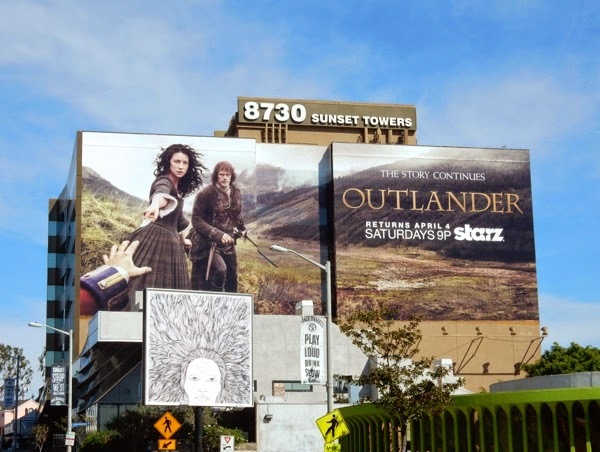 The super-sized billboard was then replaced by imagery echoing the key art used for Outlander's series premiere billboards. 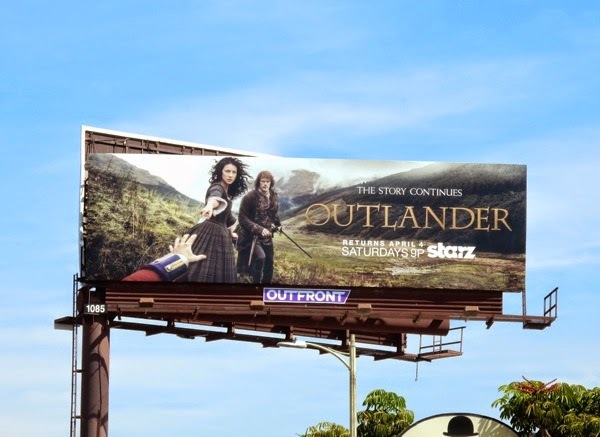 The ad may have been shot in the same scenic Scottish location, but instead of the World War II combat nurse reaching out to her former husband in 1945 against the backdrop of the highlands of 1743, this time she's flanked by Jamie as she fends off Randall (the aggressive ancestor of her husband from the future). 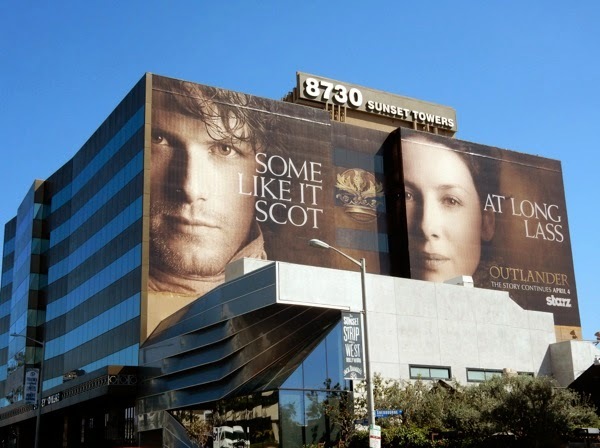 These new Outlander midseason billboard creatives were spied on March 14, 2015 in the same Sunset Boulevard and Vine Street ad locations. 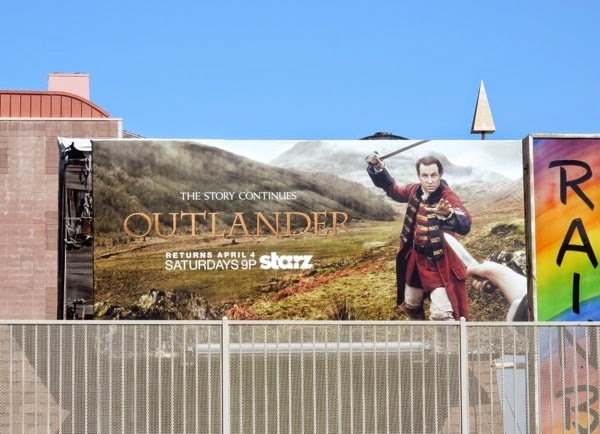 The story continues on April 4, 2015, are you ready to return to the 18th century and face whatever trials, tribulations and romance awaits? 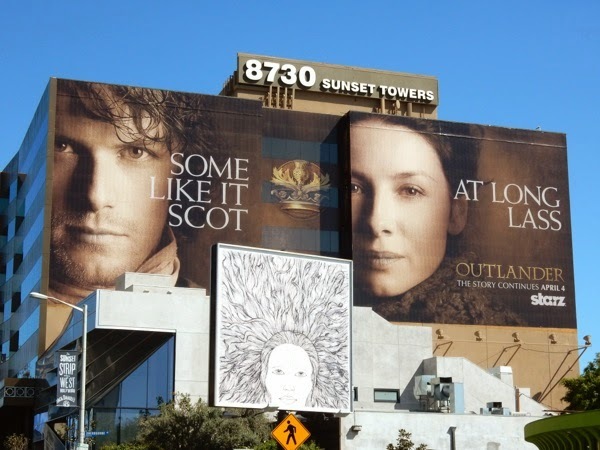 UPDATED: And here's a billboard featuring the the reverse of this image with 'Black Jack' and his sword drawn, spotted along the Sunset Strip above the Rainbow Bar & Grill on March 19, 2015. 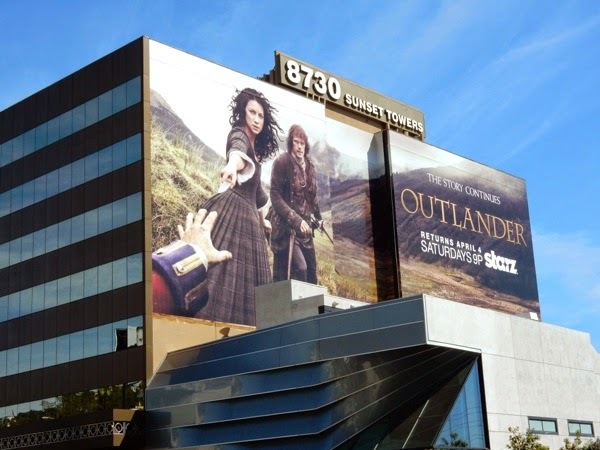 UPDATED: If you're a fan of the show, be sure to also check out these original costumes from Outlander season one on display, including Claire's wedding dress.